I'm clearly demented or perhaps I'm just avoiding the realities of winter because I can't stop thinking about summer sandals. Over here, we're having rain, floods, storms and oh, more rain. Roofers are doing a rip-roaring business because nearly everyone I know have issues with leaks and damp walls. Including me. Across the Atlantic, you've got the polar vortex that's sweeping across the U.S. Most of you over there are having it far worse than the rest of us here. You know how it is when I shop. Fantasize, analyze, scrutinize........ the long drawn process goes on before I take the plunge. It's the only way I know how to curb any unnecessary expenditure (oh bugger it, all shoe purchases are unnecessary but they're good for the soul, says the Queen of Justification). Getting rid of stuff is way WAY harder than buying. Anyways....... back to the analyze stage.... I've noticed that I've got tons of vanilla sandals. In other words, plain Janes. Ack, boorrrrrring. 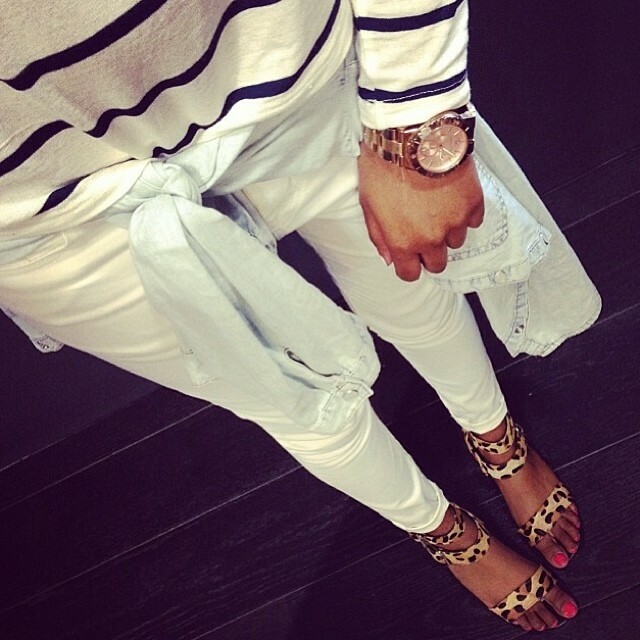 I want BADA$$ look-at-me-and-hear-me-ROAR type of stripy, lace up, caged, statement sandals. Noooooo........I'm NOT channeling 50 Shades of Grey whatchamacallit. As you can tell, I've been busy poring over Senso's instagram account. I used to think that their shoes are a little over the top but I'm loving their spring/summer collection. Edgy but not crazy. I'm pleased to see that fancy mid heel footwear aren't as elusive as Yetis these days. Perhaps designers are starting to realize that women aren't all that keen to revisit the lotus feet aka foot binding trend. You've probably noticed that I've inadvertently managed to slip in the Aquazzura Belgravia flats (okay, okay, it was intentional). The price still makes my eyes bleed but one can dream. 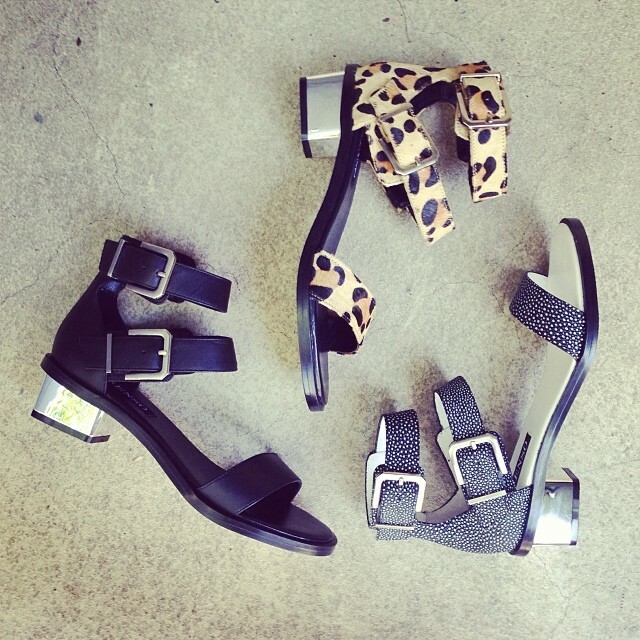 The Senso Fifi and Fafi (I'm trying my hardest not to chuckle when I say the names out loud) sandals are just as edgy. Perhaps not as formal as the Aquazzuras but the price point is far more palatable. What do you think, ladies? 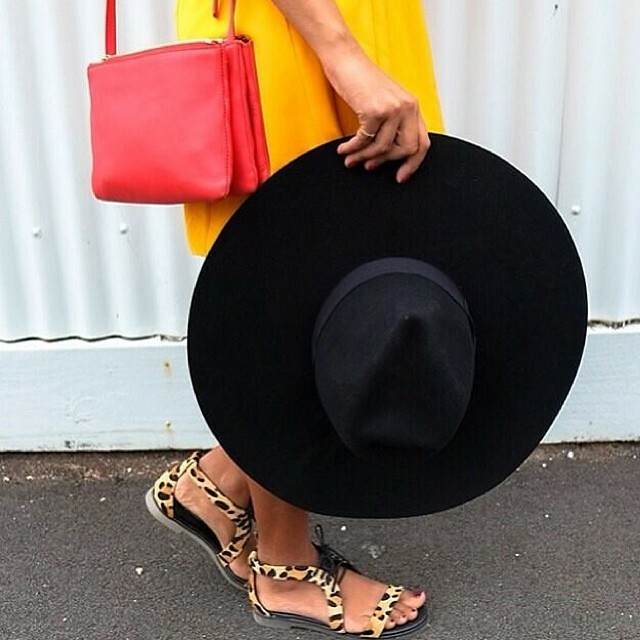 Are there any edgy statement sandals that tickle your fancy at the moment? Actually, I would love to see the reaction of the locals' faces if I ever wore them out. It's all country/quilted/barbour jacket-ish type of place here. I love the others but no. 6 is making me uncomfortable! I knnnnooooowww but Blair Eadie of Atlantic Pacific made them look so cool. It's probably not a good idea to go out in the hot sun with them attached to one's legs. Imagine all those tan square marks. I "need" them too though I'm starting to wonder when I'll ever wear sandals. hahahahaha.......Actually, you're kinder than a friend who mentioned that she could play tic tac to on the square tan marks if I wore them out on a hot day. 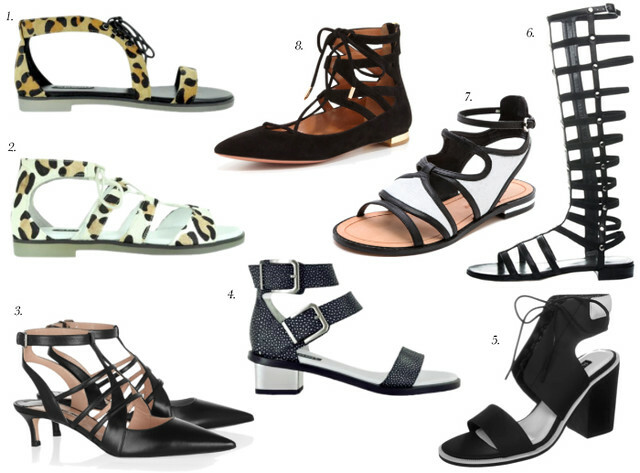 I can't believe how many great sandals there are on the market at the moment. 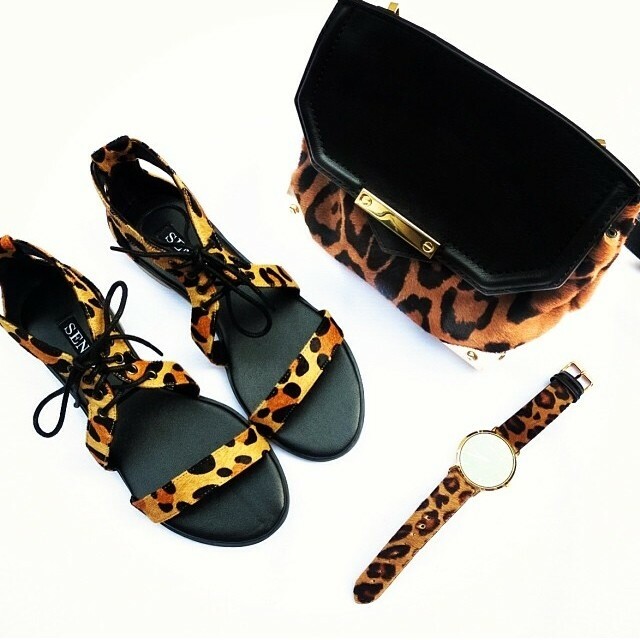 I'm loving that pair by Senso and the black Miu Miu ones. It's a little too cold for me to be thinking about sandals. I did spend most of last night looking for close toed stack heels, nothing that caught my attention so the search continues! Is it still cold in Dunedin? My brother was saying that it was so hot in Auckland. Ahhh nice! I would go for number one! Wellllllllllllll! I would rather say that nothing appealed to me in your selection, despite the fact that the crystal clear heel and the cheetah print but those one (sorry about that) remind me of ... an iron. There I said it! And as the gladiator, never liked them, at least these are like the thread aroung a roast beef. Woow I am in a good mood tonight. Allright I reckon also that there are too much ..toes for my liking, I still have issues with showing one's toes, especially with a french (sorry ladies but really a french, so outdated, on toes, really?!). I only bought sandals, I mean sandals showing toes (all of them by the way) 3 years ago, my first one (does the ones my mother bought me as a toddler count?). Am I a snob? Sometimes I wonder...! !